Orchidectomy is the removal of one or both testicles. Neutering is a bilateral orchidectomy. Bilateral orchidectomy is most often performed to prevent a male dog from breeding and to prevent prostatic and testicular diseases. Orchidectomy may be performed for the treatment of testicular tumors and some prostate gland conditions. It is also used to control hormonal (testosterone) dependent diseases such as perianal adenomas. My dog has only one testicle and my veterinarian recommends an orchidectomy. Why is this? In the male fetus the testicles begin their development next to the kidneys and migrate through the inguinal canal into the scrotum. Both testicles should be in the scrotum at birth, although the descent of one or both testicles may be delayed. Both testicles should be descended by four to eight months of age. Undescended testicles or cryptorchidism occurs when a testicle becomes trapped in the abdomen or inguinal canal. 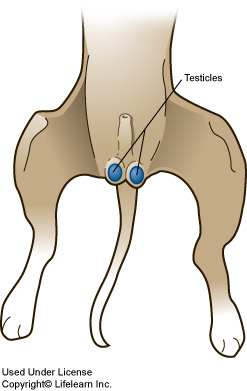 These testicles are at greater risk for developing complications, especially cancer. Cryptorchidism is considered an inherited condition and affected dogs should not be bred. The surgical procedure is similar to a normal neutering except that two procedures are performed, one on the normal testicle and another abdominal surgery to remove the undescended testicle.